Elaine Yunker Whiteley passed away in Portland on January 4, 2019. Elaine and her husband Ben Whiteley were long-time supporters of OSU Physics, the College of Science and the University. 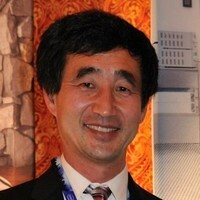 Elaine was the daughter of Edwin Yunker, former chair of OSU Physics. Elaine and her brother Wayne Yunker and other family and friends of Ed Yunker established an endowment to support the Yunker Lecture series, which has brought many distinguished speakers to the Physics Department to share their passion for science. Elaine and Ben also established the Whiteley fellowship, supporting graduate students in Materials Physics and Chemistry. Elaine and Ben received the College of Science Distinguished Service Award in 2016. Elaine was also a patron of the arts, an avid reader and she loved the outdoors. At her memorial service in Portland, Elaine was fondly remembered by her sons Stephen and Ben Jr as a kind, generous, intelligent and determined woman. That’s how we remember her, too. We will miss Elaine and Ben’s presence at the Yunker Lectures, but their gift lives on. Link to the obituary of Elaine Whiteley in the Oregonian. Posted in Alumni, History, In memorium. 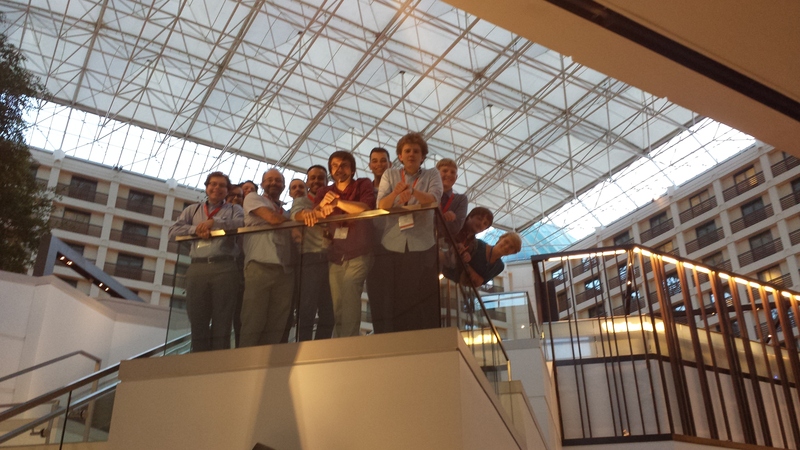 The PhIS group (Physicists for inclusion in Science) has been busy this year! 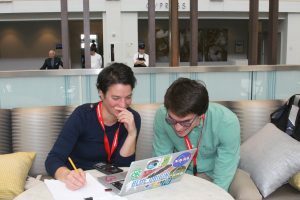 The group fosters inclusion by providing an inclusive community, professional development opportunities, and mentorship for aspiring physicists. 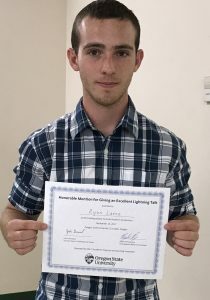 This year, their activities have included coffee breaks, mixers (including an amazing dinner and silent auction for the department), book clubs, and many outreach activities. 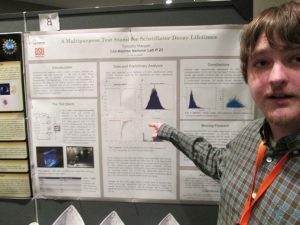 Check out all the fun at http://blogs.oregonstate.edu/phis/2018/05/07/physicists-inclusion-science-phis/ . The 2018/19 elections have happened and the new PhIS leadership is: MacKenzie Lenz (President), Kelby Hahn (Vice President), Mike Vignal (Treasurer), Mattia Carbonara (Secretary). They invite everyone to join! Posted in Alumni, Graduate Students. s of women in physics in the United States and the problems that women in physics experience. The delegation will also be completing a project that will provide tools to aid women in physics, and Nicole will contribute to this as well. Although she will not be part of the subset of the group that will travel to the conference itself, her contributions will. This is an exciting opportunity for Nicole to work with women around the country to focus on encouraging diversity in physics. Bethany Matthews, a 4th-year graduate student in Prof. Janet Tate’s lab, has won a U.S. Department of Energy (DOE) Office of Science Graduate Student Research Award. The award is for the proposed research project, “Microscopy Analysis of Metastable Heterostructural Alloys with Anomalous Piezoelectric Response”, to be conducted at the National Renewable Energy Laborat ory (NREL) in Golden, CO during the summer and fall of 2017. 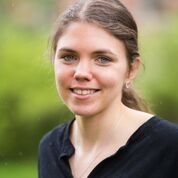 The award citation states that, “The SCGSR award is in recognition of outstanding academic accomplishments and the merit of the SCGSR research proposal, and reflects Bethany Matthews’s potential to advance the Ph.D. studies and make important contributions to the mission of the DOE Office of Science.” Congratulations, Bethany! 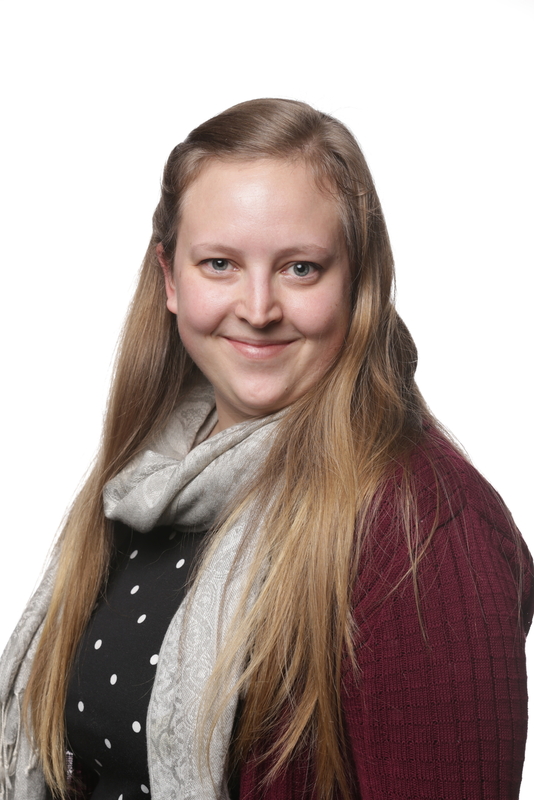 Bethany will work with Dr. Andrew Norman of NREL and also with Prof. Brian Gorman and Dr. Andriy Zakutayev, her collaborators in the DOE-funded Energy Frontier Research Center, the Center for Next-Generation Materials by Design. The EFRC members study metastable materials of many types, and Bethany’s role has been understanding metastable alloys. 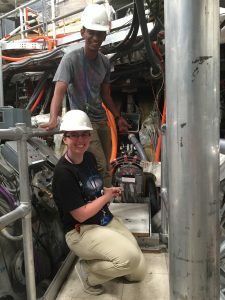 Her developing interest in transmission electron microscopy, using OSU’s Electron Microscopy Facility under the guidance of Dr. Pete Eschbach, led her to submit a proposal to DOE to study metastable alloys with microscopists at NREL and Colorado School of Mines. Posted in Awards, Graduate Students, Research, Students. The Oregon State University Society of Physics Students (SPS) made a strong showing at the Sigma Pi Sigma Quadrennial Congress, which was held on November 2-6, 2016 in San Francisco. In cooperation with LBCC students and faculty, SPS secured funding to send 1 graduate student and 7 undergraduates from OSU and 3 LBCC students to the Congress. The students presented posters, toured scientific facilities, networked with professionals, and listened to talks by the leaders in Physics. 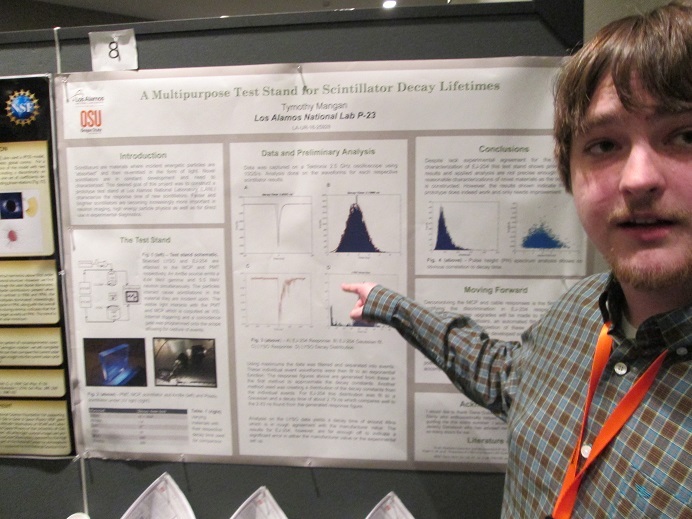 Michael Forkner and Tym Mangan (pictured with their posters) were among the undergraduates who presented the innovative research being done at Oregon State University. 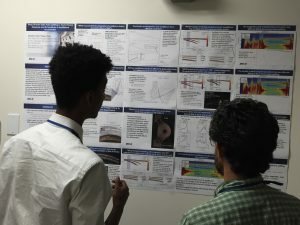 During the poster sessions, students discussed their work with other physics students from across the country and received feedback from professional physicists on their presentations. They also toured the Stanford Linear Accelerator or the Google X facilities, and listened to talks by professional scientists while looking at the sort of labs they might work in one day. There were exciting plenary talks, including one by Dame Jocelyn Bell-Burnell who discovered quasars. She thinks that the climate in physics for women has improved considerably since her days as a young scientist. Eric Cornell, Nobel Laureate (and former Yunker lecturer) gave a characteristically upbeat and interesting talk about what the life of a real scientist is like. Between plenary talks, PhysCon conducted workshops that allowed SPS members from across the nation (and beyond!) to network and discuss important topics faced by chapters and individuals during their physics journeys. Grad student Kelby Hahn was a panelist who discussed life as a graduate student. The students were delighted to made connections that will last well beyond their short stay at PhysCon. Kelby Hahn, Michael Forkner, Evan Peters, Tym Mangan, Elliot Capek, Hazel Betz, Gabe Nowak, Nikita Rosanov; Osvaldo Galvez, Delphine LeBrunColon, Eric Slyter. Posted in Society of Physics Students, Students, Undergraduates. The annual Fall Meeting of the Materials Research Society’s “best poster” awards are eagerly anticipated, and this year, James Haggerty garnered his second one. 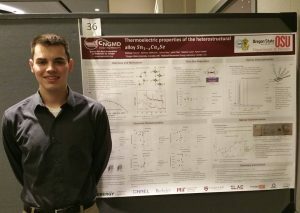 James presented a poster on his work on titania polymorphs at the Fall 2016 meeting in Boston, MA. 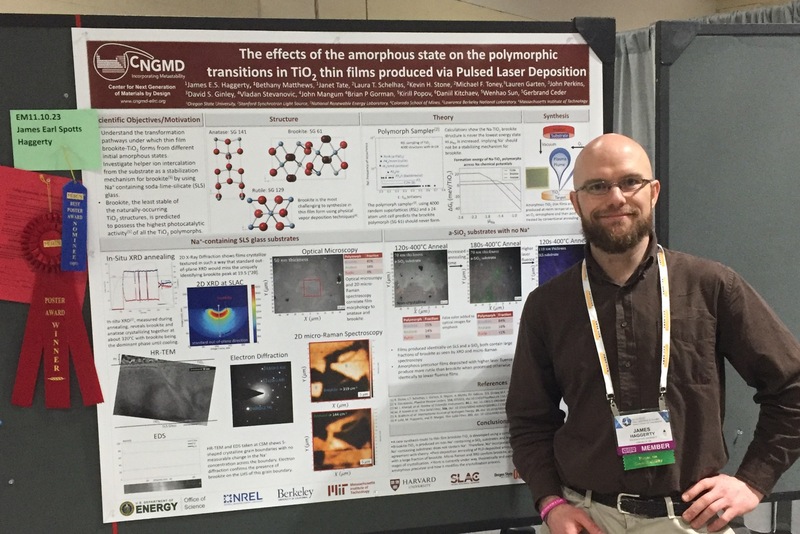 The poster, entitled “The effect of amorphous precursors on the crystallinity of TiO2 thin films using pulsed laser deposition,” is a collaborative effort between Tate group researchers and scientists from the National Renewable Energy Laboratory, the Stanford Linear Accelerator Center, Lawrence Berkeley National Laboratory, MIT and the Colorado School of Mines. 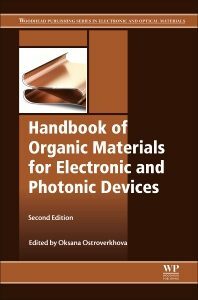 The researchers are trying to understand why a particular metastable form of TiO2 called brookite is difficult to grow. 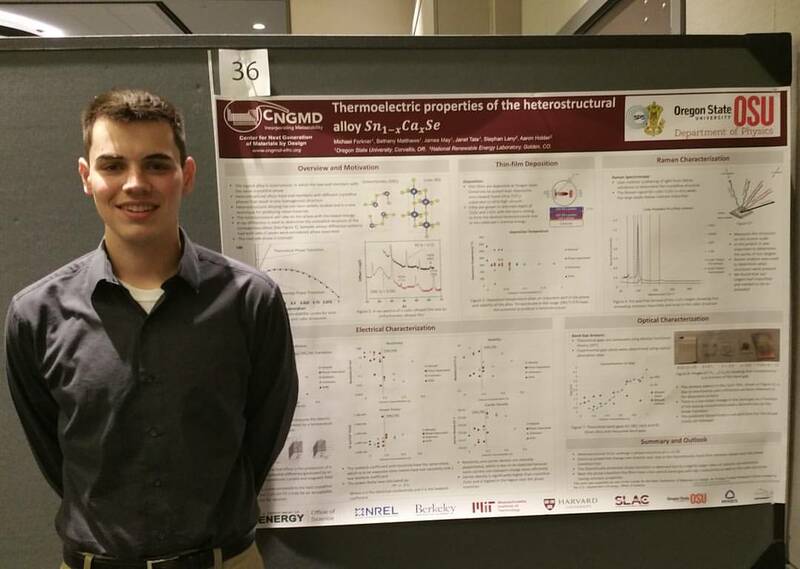 James’s poster presented evidence that the presence of sodium ions, thought to be important in the growth of bulk crystals, is not necessary in thin-film growth. Bethany Matthews and Janet Tate were co-authors on the poster. Last year at the Fall MRS meeting, James and Bethany both won best poster awards – maybe a three-peat in 2017?! Posted in Awards, Research, Students.